Shorten the honeymoon period for new employees and make them more productive, faster. 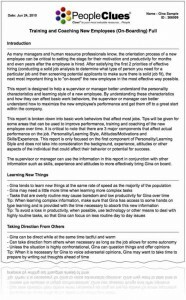 The Onboarding tool helps the supervisor or manager better understand the personality characteristics and learning styles of the new employee in order to maximize performance as quickly as possible. Imagine knowing how well a new employee will adapt to change and how well they will take direction. That knowledge along with specific tips, will help supervisors train and get the new employee up to speed and become a productive team member. Find out if that new employee prefers to learn new information rapidly or if they prefer to get it in small pieces over time. This shortens the learning curve and produces a quicker return on your investment with new employees? The candidate’s personality and learning style determine their basic work behaviours in areas such as “Learning New Things”, “Taking Direction From Others” and many others, that affect most jobs. Tips are also included to improve performance and training and coaching. The candidate’s personality and learning style determine their basic work behaviors in areas such as “Learning New Things”, “Taking Direction From Others” and many others, that affect most jobs. Tips are also included to improve performance and training and coaching. Click the graphic to view a sample report. The Personality assessment measures personality traits or characteristics. The Cognitive assessment measures speed of problem solving and learning styles.